Adisa Bakari had a simple plan. He would go to college on a football scholarship, become an All-American safety and then get drafted into the NFL to live a life of luxury and fame. But reality quickly set in. After three seasons of Division I-AA football, the Washington, D.C., native realized professional football wasn’t in his future, something overwhelmingly common in college athletics. (According to a 2017 NCAA study, only 1.5 percent of college football players are drafted into the NFL.) So he decided to become a sports attorney. 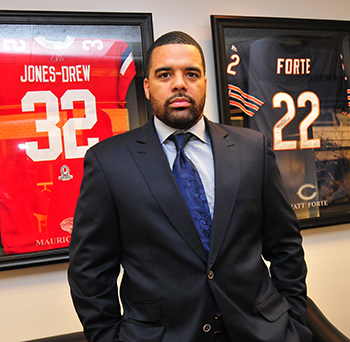 Bakari, 44, is the founder and CEO of The Sports & Entertainment Group (TSEG), a D.C.-based sports agency that represents some of the top athletes in the NFL and professional boxing. Bakari and longtime partner Jeff Whitney, 47, who serves as the company’s president, currently represent 43 professional football players, including Pittsburgh Steelers running back Le’Veon Bell, Buffalo Bills quarterback Tyrod Taylor and New York Jets running back Matt Forte. The firm also represents professional boxers Lamont and Anthony Peterson. The pair’s background as executive compensation lawyers and litigators makes every athlete they represent a “corporate executive,” which means TSEG provides comprehensive business and legal services normally limited to high-level executives at Fortune 500 companies, including intellectual property protection, real estate consulting, and tax and wealth preservation planning. Over the past few years, the firm has also become the central hub for representation of athletes from historically black colleges and universities (HBCUs). 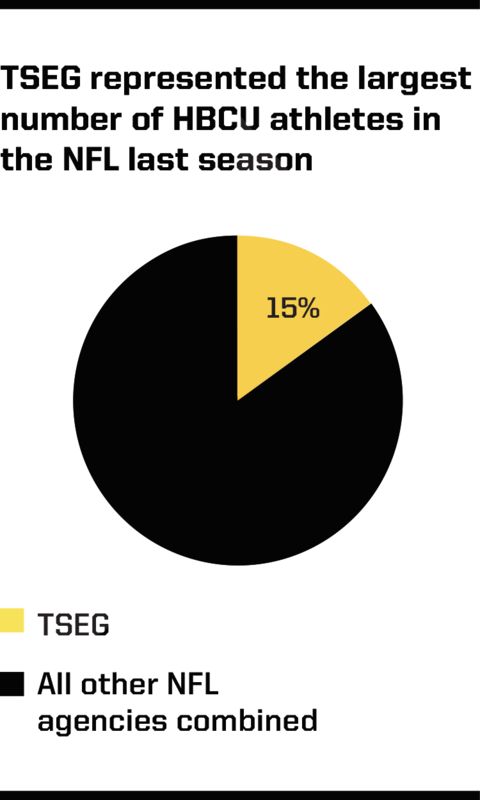 Of the 32 HBCU players who were on NFL rosters at the beginning of the 2016 season, TSEG represented five of them (15 percent), the most of any other firm in the country. Those players included San Francisco 49ers safety Antoine Bethea, Dallas Cowboys linebackers Justin Durant and Deon King, Indianapolis Colts defensive end Kendall Langford and Detroit Lions safety Don Carey. While signing HBCU players was never a priority for TSEG, the company has made a concerted effort to monitor players from conferences such as the Mid-Eastern Athletic Conference and Southwestern Athletic Conference. “Anytime we see a top black college prospect, we certainly target them,” said Bakari, who graduated from Delaware State in 1995. Whitney didn’t attend an HBCU but added that those athletes “are often very much in tune with community issues” and tend to be men and women who understand that the world is much bigger than them. Over the past 15 years, the two have signed more than 20 players from HBCUs; the first was Delaware State alum Darnerien McCants, who played for the Washington Redskins and Philadelphia Eagles from 2001-05. With the NFL draft this week, TSEG has a handful of exceptional prospects from HBCUs whom it can target, from North Carolina A&T’s Tarik Cohen to Tennessee State’s Ezra Robinson and Jessamen Dunker. Bakari grew up in the shadow of the 1980’s crack cocaine epidemic in D.C. At the time, blacks made up 70 percent of the district’s population (compared with 50 percent today), and most of the district’s murders were drug-related. Not many young black boys and girls made it out of high school in the early 1990s, but in the Bakari household — what he fondly recalls as a “loving environment” — going to college was more of an expectation than a goal. He chose Delaware State because of the football program’s winning tradition — the Hornets won five conference titles from 1985-91 — and the school’s academic reputation. Once on the historically black campus, Bakari was challenged daily to consume political and social history through a black-focused lens. That’s the purpose of all HBCUs, from Delaware State to Lincoln University to Florida A&M: creating an educational environment that highlights and stresses the black experience. As a former football player, Bakari applied this line of thinking to professional athletes, 16 percent of whom end up broke within 12 years of retirement despite being part of professional sports corporations that rake in billions of dollars every year. “We see tens of millions of dollars being made by these individual athletes, but we don’t see the level of wealth preservation and wealth generation that we should see,” Bakari said. After Delaware State, he attended law school at the University of Wisconsin, and after graduating he practiced as an executive compensation lawyer and sports attorney at law firms Dow Lohnes and Kelley Drye & Warren LLP before venturing out on his own with TSEG in 2016. Aside from working with athletes from historically black universities, TSEG has also targeted prospective sports agents from those schools. Since 2001, Bakari and Whitney have hired about 15 interns from HBCUs, mostly from Howard University’s law school. Their most recent intern is former Howard basketball player J.T. Miller. “Once I came to Howard, I saw how successful black people could be,” the 23-year-old said. He was constantly surrounded by “wealthy and successful” black men such as Bakari, Whitney and Kery Davis, Howard’s athletic director, who could guide someone who aspired to be a sports agent since he was in high school. Outside of Miller, former TSEG interns have gone on to work in the sports and entertainment industry, including an NBA team and a Los Angeles-based marketing company. Bakari and Whitney have also worked to develop a stronger overall relationship with HBCU campuses, serving as guest lecturers, presenters and panelists at local universities Howard, Morgan State and the University of the District of Columbia. They emphasize to these future sports agents that they have to be passionate about not just sports but also helping young athletes and their families develop and maintain wealth.